My poor purse (ie the small pink leather container I keep my money & credit cards in rather than the bag it lives in) has grown fatter and fatter since we arrived in Singapore to the point where it was straining to stay shut and it wasn’t due to having untold riches in Singaporean notes either. Time for it to go on a diet methinks and emptied it completely. The main contents – three driving licences (one UK, two Singaporean for cars & boats respectively), three bank cards (two UK, one Singaporean), a handful of yachting related cards, a few Singaporean bank notes and a small amount of change – were much the same as the usual contents for the 8 or 9 years the little Radley Dog has been keeping guard over it. However there was one big difference. Back in the UK, I like most shoppers had a loyalty card for a couple of my most frequently used supermarkets, one more for Café Nero as they were on my route from the carpark to the office and that was about it. 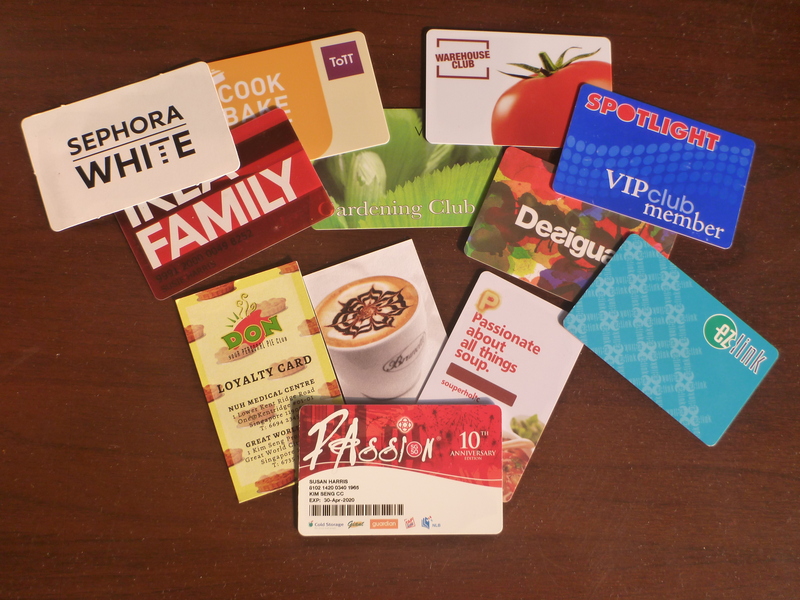 How many is too many loyalty cards? Not so here in Singapore – it seems I have been collecting more with almost every shopping trip and these were what was causing my purse to bulge. I can collect points at the garden centre and various cafes & restaurants whilst IKEA and Spotlight (an Australian fabric, craft and haberdashery emporium that I will sorely miss when we leave) have special offers for club members as do Sephora, TOTT (Tools of the Trade – a specialist cookware store where I finally tracked down a proper milk jug!) and Desigual who kindly gave me an extra 10% off some t-shirts in a sale in return for a card. Even our local hot pie shop ‘Don’ has a ‘collect 5 stamps and get $2 (around £1) off your next purchase’ scheme! And all this despite ensuring that the business cards virtually every small shop gives you when you wander into browse or enquire about something it turns out they ‘don’t have madam’, are ruthlessly pruned every week. Cards from restaurants where we’ve enjoyed a meal or acquaintances we’ve met on social nights out are filed away at home in case a telephone number or location is required in the future. Everything else is mostly filed under ‘recycling’. There are two cards I do find extremely useful – one is the Ez-Link card for bus and MRT (underground) fares and the other the PAssion card which is part supermarket loyalty card and part membership of the local community centre. The latter means I belong to the wider Peoples Association or PA, hence the name ‘PAssion’ (Singaporeans are quite clever at quirky marketing). The PA offers lots of reduced price tickets to events, many courses on anything from Chinese Calligraphy to computing for Seniors (as OAPs are referred to here) and other offers to its members. Membership costs a mere $12 for which you also get a free gift, in my case a useful little gym bag I take to the sailing club every week with a change of clothes and shower things. However the main reason expats acquire a PAssion card is for the Cold Storage/Giant points which save money on the weekly supermarket shop. You can also collect PAssion points in Guardian chemists plus a couple of other stores belonging to the same group. And I could even stop carrying around that Ez-Link card as my SG50 branded Passion card is also an Ez-Link card, it just needs a top up! Loyalty cards are only useful to the holder if you actually have them with you so turfing my collection out of both purse and handbag isn’t really an option. Wandering through the upper floors of the Peoples Centre Market looking for some batik fabric in a particular shade (which I didn’t find) earlier this week I came across a solution for my bulging purse that was not only practical but also very pretty. 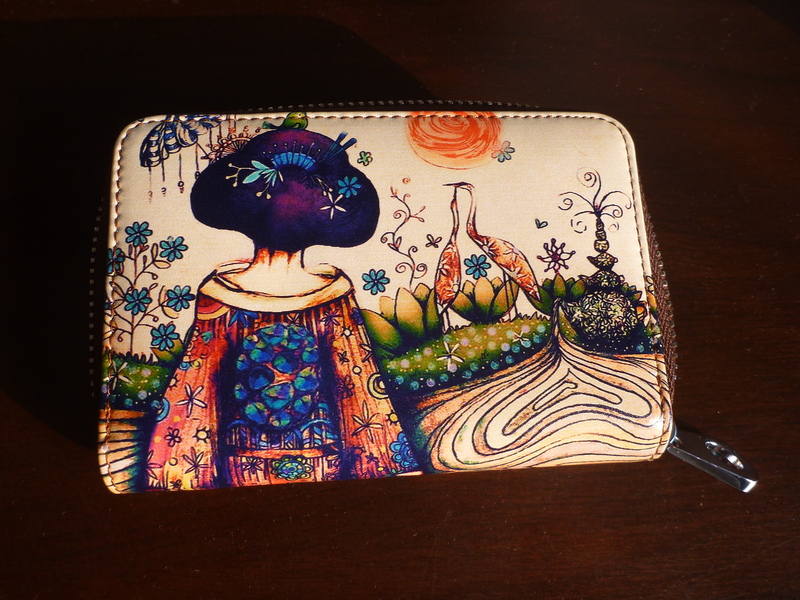 It’s a painted leather wallet with space for all the cards and will probably be in use long after I have left Singapore. And as one who can’t resist a bargain I was additionally pleased when the chatty lady stall holder gave me a few dollars off as I am a Singapore resident. Miraculously I somehow escaped without her business card too so you’ll have to hunt the stall down yourself!